Although some people love being in the kitchen, not everyone is at ease with the finer points of utilizing the modern style kitchen appliances. Some are simple, but often inconvenient for the average users. No matter what, after the innovations of technology in the 21st century, it is about time that some new spins were put on the old kitchen appliance options. Touch-free devices are used to fulfill needs of the modern kitchen today. From the sink to the garbage, every kind of obsessive behavior associated with cooking or food preparation is part of the art. While hands-free kitchen appliances maybe a luxury, these devices also are designed to make many aspects of kitchen usage easier, while waiting for the next culinary masterpiece to be finished. So this year, why not consider one of these 5 must-have hands-free kitchen appliances. Being the first one on your block to have one is sure to annoy and impress your neighborhood residents. Here are the best ones without any spin or hard selling, just top quality kitchen tech for your home at your fingertips. Moen’s MotionSense faucets allow users to wash their hands without ever needing to touch the handle or sink faucet. All Moen faucets are built with advanced motion sensor technology, so water is activated without any typical plumbing issues and can be preset to the desired temperature. Once the faucet is fully installed, there is a wave sensor that allows users to wave their hands above the device to turn it on or off, and this sink can auto shut itself off during periods of inactivity. All Moen MotionSense Faucets are made simple enough for do-it-yourself installation and require a six AAA battery pack. Simplehuman makes tools for efficiency and busy lifestyles. This is the perfect merger of technology and user friendly appliance adaptability. Easily the best automatic soap dispenser available on the market, the Simplehuman Sensor Pump is designed with a removable caddy to lay your dish sponge. It has a soap dispenser volume control, so nobody gets massive soap blob, when all you needed was a few dabs while doing dishes. The motion sensor is powered with 4 AA batteries, but can be turned off while the sink gets used for other purposes. Fans of this model, might want to also investigate the Simplehuman Tension Arm Paper Towel Holder sold online for only $25. These are fine examples of how the Simplehuman line is changing the modern kitchen. For the next innovation in home garbage technology, it only takes looking for the Superhuman company once again. This is their 55-liter deep answer to the garbage can. Simplehuman Rectangular Sensor Can users say it is exactly the right size for any kitchen, because of its huge holding capacity, and how it opens automatically using motion of only a waving hand. For most users, this device is pretty smart and detects subtle differences between a waving or passing hand. If your Simplehuman Rectangular Sensor Can lid is open, it will stay that way, until all hands are free of its trigger zone, but the shutting lid can be a bit loud for some users. 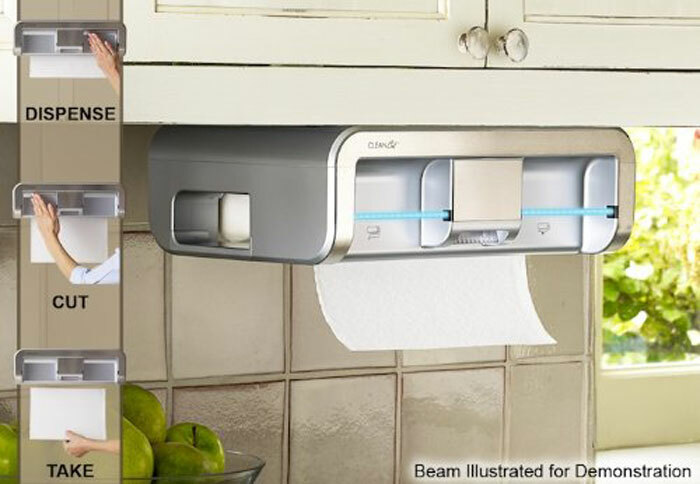 If you aren’t set on a strict budget, this is the Clean Cut Touchless Paper Towel Dispenser. The under-cabinet style design, make this a great high-tech option. 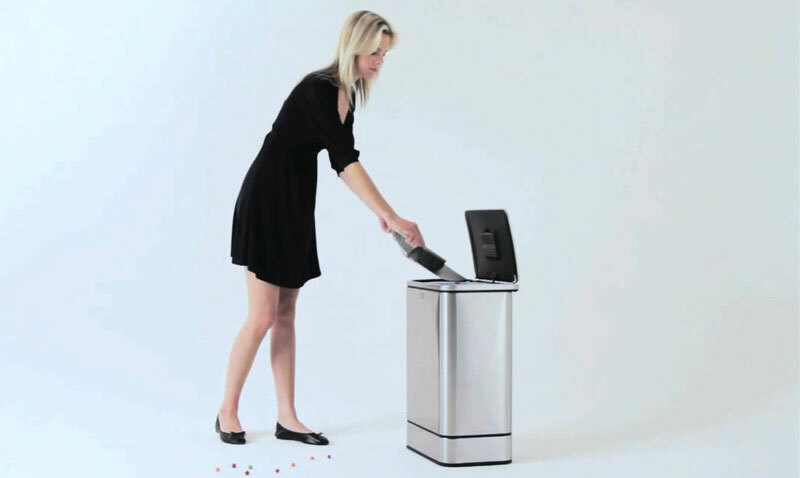 Having LED Breaking Beam technology, lets users control the amount of towel dispensed. When the amount wanted is reached, simply removing your hand activates the cutter, allowing it to dispense all lengths, even pre-perforated brands of paper towels. Clean Cut Touchless Paper Towel Dispensers require an AC adapter for powering and approximately 15 minutes of home installation. If you don’t own a robotic vacuum, now is time to consider getting one. 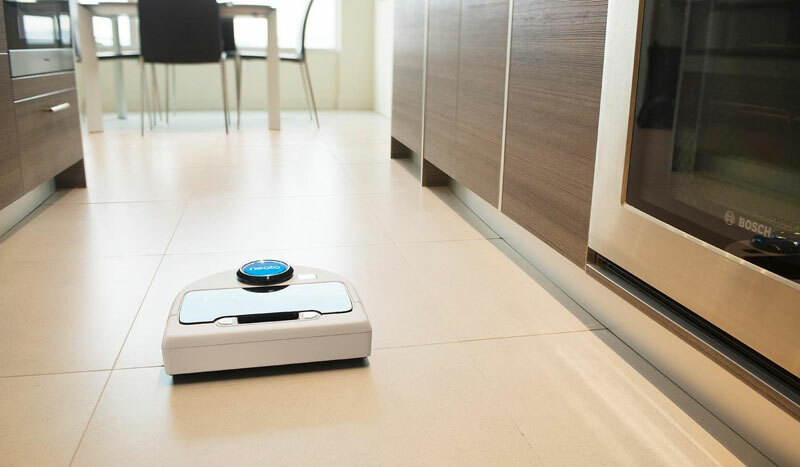 Nothing defines the hands-free home appliance like the Neato Robotics BotVac. Made for the pure convenience, this robotic vacuum uses smart scheduling and laser guided navigation system technology. There is a retail battle between Neato Robotics BotVacs and a few competitors within this developing hands-free technological era, but all are made more for carpeting or other low laying obstacles. If your needs are centered on hardwood flooring or cleaning under the desks or other hidden spaces, no other automatic vacuum will work harder for your money. In conclusion, nothing is written in stone, nor able to be cleaned up, so easily. Modern appliances must adapt in order to survive in the global marketplace of this new age of the human species. All over the world, there are signs of hands-free being used for more industries and hopefully become more acceptable to average human customers. One way or another it seems, the non sanctioned actions have already crossed paths without saying much at all. Out in western America, these are the appliances that get the most dedication from clients, but only after we show them what we do for real. Don’t wait for the next revolution in high tech devices, when having any of these6 must-have hands-free kitchen appliances would make your kitchen more functional. Also one or more of these new kitchen devices will make a modern impact on the way most people view cooking and culinary activities for the home. Don’t work hard, when your modern home kitchen is able to work with you. Each device or must-have hands-free kitchenappliance in this article, demonstrates one of many innovative ideas about how homes are changing their needs, equipment and individual choices in technologies for the home. Being part of the 20th century, anyone can attest to the primitive state of tools for modern kitchens. The need for more complex solutions in this niche market of technologies is reassuring in the digital age. It show that worldwide users are becoming more savvy, when it comes to name brands versus what they will actually purchase. Now is the time to invest in the future for your household kitchen and never remember why someone didn’t invent these conveniences long ago. So get the kitchen, you have always dreamed of, right now.